I originally wrote this article for Skippers Review – https://skippersreview.com/blog/?p=276. There are two types of waves, swell waves, which are made somewhere else and have moved in and wind waves, which were produced by winds locally. Wavelength (the distance between each wave crest) and wave height depend upon the wind strength, how long it has been windy for, the water depth and the fetch (the distance over which wave-generating winds blow). Swell waves are the waves that surfers usually surf. They are the large waves that are often present on an otherwise completely calm day. They are generated for days in the middle of oceans and they last for about as long as they have taken to be produced. They can move thousands of kilometres across the oceans and they often have huge wavelengths. 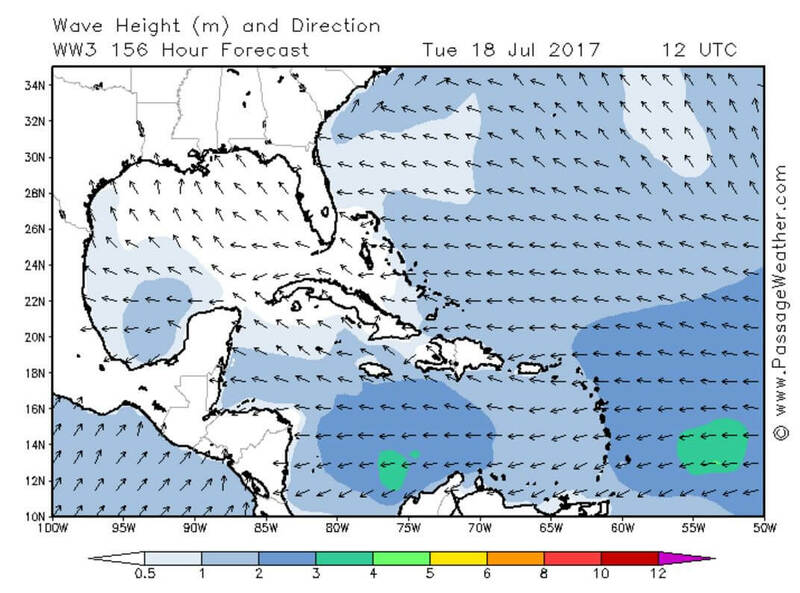 As swell waves can last for days after they were originally created it is always worthwhile to check a swell forecast. I find Passageweather.com the most user-friendly.Wind waves are locally produced waves and they can be created within an hour. Usually the longer the fetch is the taller the wave height. If the wind has been blowing for 2 hours at 10 knots, the wave height will be approximately 25cm so long as the fetch is more than 8km. If that wind continued for 6 hours more then the wave height would be 50cm assuming the fetch is more than 40km. See the chart below for more wave height examples. Wave height is also impacted by water currents. If the current is in the same direction as the waves, then the waves will be flatter, but if the current is in the opposite direction to the waves, then the waves will become steeper. This is because in wind against tide situations the waves are slowed, and as waves cannot easily lose energy the speed energy of the waves is transformed into making taller and steeper waves. In tidal waters, this effect is known as wind against tide.When waves reach shallow waters they start to behave differently. They slow down when the wave starts ‘feeling’ the ground, thus increasing wave height and decreasing wavelength. When the water is too shallow the wave eventually becomes too steep to be able to stay upright, so the crest falls down. This is what occurs when waves break. Waves will start feeling the ground in depths less than half a wavelength. When the wavelength is only a few meters long this effect is of little use to the sailor as the water is too deep for the waves to feel the ground. However, issues arise when the wavelength is hundreds of meters long like it so often is in the North Atlantic. The Bay of Biscay is a perfect example of when waves with 500meter wavelengths then start to feel the bottom of the relatively shallow (200m deep) Bay of Biscay. This causes the waves to become much taller and combined with an Atlantic storm the fearsome Biscay conditions occur. Waves travel in straight lines until they reach an obstruction, like a breakwater. The waves that do not hit the breakwater will, instead of continuing in a straight line, diffract (bend) around the breakwater meaning that even if you are behind the breakwater, the waves will still reach you. This is also obvious in bays with a narrow entrance like Lulworth Cove in the UK. Waves will also bend around obstructions like islands causing a confused sea state. The waves that hit the breakwater will be reflected off it, causing a jumbled and turbulent sea state. Headlands will also amplify wave height, with the largest waves being just of the end of a headland. When passage planning, especially when using motorboats it is important to look for features that will cause a more jumbled and steeper wave state. Make sure you check for wind against tide, as waiting a couple of hours will often allow for a much flatter journey. Also steer clear of shallow areas or headlands which generate increased wave height. River and harbour bars often have larger waves, especially when the tide is on the ebb, so it may be worth entering harbours on a rising tide. Chichester Harbour in England is a great example of this and waves are probably twice as tall at the entrance during an ebb tide than elsewhere. It is also important to remember that even small waves can ruin comfortable anchorages, so always remember that waves can diffract around headlands into sheltered bays. With all this in mind boating should be more enjoyable, especially for the family and also safer. Olly Perkins is 15 years old and currently sails for Britain in his Laser 4.7. He has written a book titled ‘The Message of the Clouds’ which teaches the reader to forecast the weather themselves using the skies. The book is available for pre-order on his blog oliverperkins.com.